BetSoft’s Slots3 collection is one of the most graphically advanced 3D game collections you’ll find anywhere on the Internet and amongst all those excellent titles, Mr Vegas comes close to taking the cake. 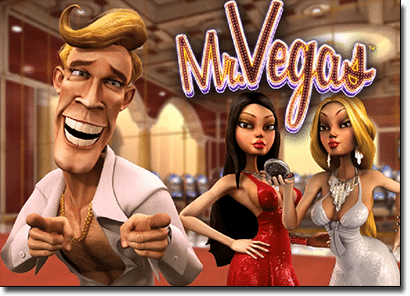 Mr Vegas captures all the cheesy glitz and glamour of Las Vegas, full of bling and jazzy tunes, with exciting bonuses to be triggered around every spin. You know you’re in for a treat from the moment Mr Vegas himself pulls up in his limo out the front of the casino, his own personal show tune playing to mark his arrival. The paparazzi flash their cameras as Mr Vegas and his arm candy are seated at a casino table and the champagne starts to flow. No need to waste your money on expensive airfares to Sin City – just throw on some sequins and log in to play Mr Vegas for real money. It’s the closest thing you’ll get to being there. Free spins – free spins are triggered by one of the games scatters, the craps dice symbol. 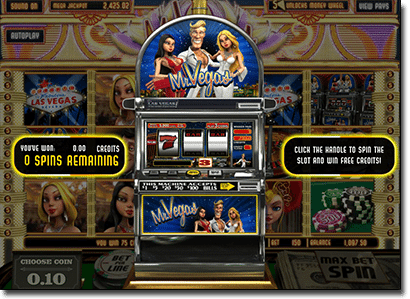 The free spins feature is triggered by the dice appearing directly on the left or right hand side of the Mr Vegas symbol on reels one, two or three. Once triggered, you roll the dice to determine how many free spins you’ll receive. If you’re lucky enough to roll doubles, you’ll also receive a 2X multiplier on all wins during the free spins round. Mini slot feature – if you land three or more of the slot machine symbols anywhere across the reels you’ll go to the mini-slot game. This bonus features an old-school one armed bandit style pokies machine and you get to pull the lever for potential bonus wins. 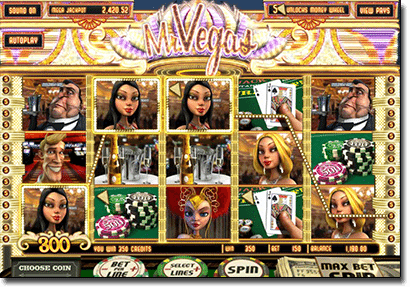 Roulette bonus round – landing the Mr Vegas character on reels one, three and five will bring you to the roulette bonus game, where you and your voluptuous sidekicks head to the roulette table. You get to select three numbers to bet on the roulette wheel and if you’re lucky enough to land one of those numbers, you can win upwards of 2,000 credits. Money wheel jackpot – when you first play Mr Vegas you’ll notice that when you spin the reels, some of the symbols will randomly show a little arrowhead icon in the top corner. These symbols form slabs of the money wheel, and when you five of these money wheel slabs at a time anywhere across the reels you’ll trigger the Money Wheel jackpot. During this feature you get to spin the wheel to land a range of awesome prizes, including free spins, credits, bonus games and the potential to activate the game’s progressive jackpot (if the maximum bet is in place). This progressive jackpot is nowhere near as lucrative as the kind you’ll find in games like Mega Moolah but it still has the potential to bring a sweet boost to your bankroll. But all the novelty aside, this game has some really fun, unique bonus features that make it a stand out. The jackpot isn’t particularly noteworthy, but is still solid enough to make this game well worth playing, especially for the range of bonus games that brings more ways to win more often. You’ll want to make sure you have a good Internet connection when playing Mr Vegas (or any of the other BetSoft pokies) to make sure you experience the full clarity and speed of the Slots3 animation. Playing Mr Vegas on a slow connection might slow the game down to frustrating levels but this shouldn’t be an issue for most players. Experience the hedonistic world of Mr Vegas today at one of our recommended secure casinos.